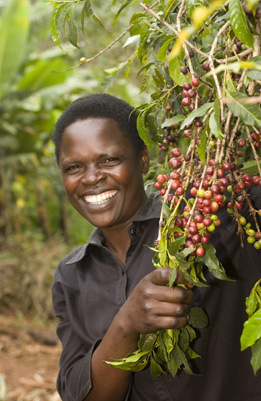 You are invited to Take A Step for Fairtrade in 2012. The challenge is to take a step further so perhaps you can try new Fairtrade products or tell a friend about how great these products are. At Fairtrade at St. Michaels we have an impressive range of crafts, fashion accessories and food. Have a peek at www.fairtradeatstmichaels.co.uk or follow us on twitter or facebook. Fairtrade Fortnight Coffee, Cake and Win Groceries! From 27th February to 11th March, pop into Fairtrade at St. Michaels shop for the chance to win a bag of Fairtrade groceries and sample chocolate brownies while you are there. 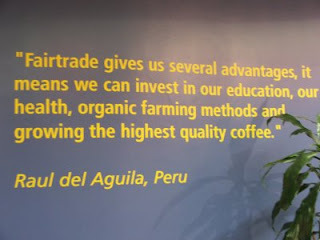 Also, to celebrate International Women’s Day on Thursday 8th March we are promoting Equal Exchange coffee grown by women farmers. Come in to taste this delicious coffee. All day: The Windmill’s 2nd anniversary almost coincides with Fairtrade Fortnight-Eve so celebrations begin today at Headington Farmers’ Market. After buying your Pippin Doughnut made, as far as possible, with fair trade and locally sourced ingredients – come to The Windmill, only a few steps away from the Pippin stall, to sample our best-selling Grumpy Mule coffee. 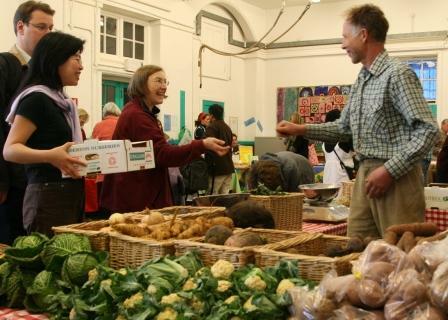 12.30-13.30: Quakers’ Fairtrade Bring and Share Lunch, Bring a dish made with as many fairly traded ingredients as possible and swap ideas and recipes with other lunchers. Venue:Friends Meeting House, 43 St Giles. 10.30-15.30 Oxford Brookes Fairtrade Market: Oxfam, The Co-Op, Just Change and many more Fairtrade suppliers will be on campus selling their fair trade products alongside freebies and taste tests! FREE ENTRY! Gipsy Lane Food Hall, Oxford Brookes University, Headington. NB THIS EVENT HAS BEEN POSTPONED UNTIL HOPEFULLY APRIL. “Give us this day our daily bread,” A session on food, faith and Fair Trade organised by Fair Trade @ St Michael‘s, Christian Concern for One World and St Michael at the Northgate. 18.30-20.30: Film screening: Black Gold. Coffee is the world’s most valuable commodity after oil, but the price paid to coffee farmers remains so low that many have been forced to abandon their farms. “Remarkable – a moving but scandalous story. It has extraordinary power.” Daily Telegraph. Tickets £8.00 standard, £6.00 member students/concession. Venue: Ultimate Picture Palace, Cowley Rd. NB The Fairtrade Business Lunch scheduled for 6th March has been cancelled. 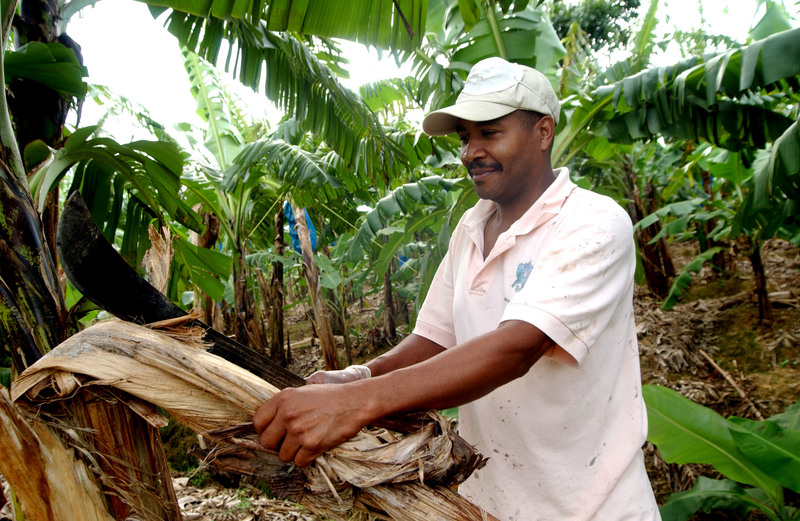 13.00-14.00 Meet Anton Bowman: Winward Island Fairtrade Banana Farmer. Anton will explain how Fairtrade bananas are helping the Winward Islands to rebuild their economy devastated by tropical and economic storms. Oxford Brookes University, Gipsy Lane Site, Headington Campus. To register your interest please e-mail: sustainability@brookes.ac.uk FREE ENTRY. 10.00-12.00 Fairtrade drinks, cakes and biscuits made with Fairtrade ingredients, and also Fairtrade products to buy. Headington Baptist Church, Old High St Headington. The Windmill in Headington will be offering tastings of products made with fairtrade ingredients. Indigo, on Cowley Rd is offering a 15% discount on all People Tree clothing. Turl Street Kitchen will be selling a range of Fairtrade food and wine. The co-op have always been passionate supporters of Fairtrade, and this upcoming Fairtrade Fortnight is no exception. They have events taking place in stores across the City, and 20% discounts on many Fairtrade products in their stores over the fortnight. From in-store tastings to fashion shows, theatre preformances from local school children, question time with guest speakers Jennipher Wettaka and Justine Watalunga fair trade coffee farmers from the Nasufwa Growers’ co-operative society, who are affiliated with the Gumutindo co-operative in Uganda. We will be asking you to re-think not only the food and drink you buy, but also the clothes you wear as we celebrate Fairtrade fortnight 2012. There are a few film festivals going on this Fairtrade Fortnight – and so we’ve been thinking about encouraging anyone showing films between 27th Feb and 11th March to show one or two Fairtrade shorts before their main features. There are loads of good videos out there: a few of our favorites are below. But what’s your favorite Fairtrade short video clip? Let us know in a comment below or tweet @oxfairtrade. 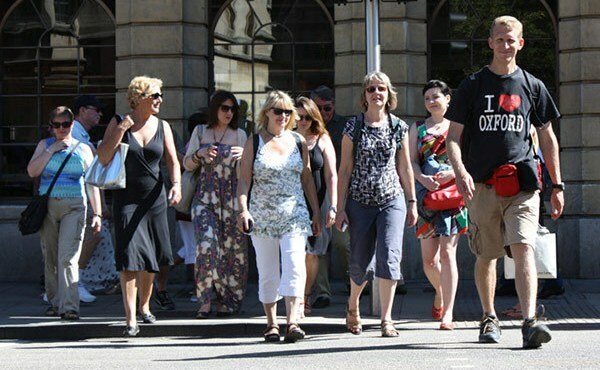 You are currently browsing the Oxford Fairtrade City blog archives for February, 2012.